I traveled to Dallas last weekend as a guest of Nissan as they introduced the new 2013 Sentra in connection with everyone hoped would be an epic match-up between two iconic college football programs. As you can see from the photos, the new Sentra looks great, but the game didn’t live up to the hype as Alabama made a statement by whipping Michigan in majestic Cowboys stadium. You can see the view from our seats in some of the photos above that capture the incredible big screens in the stadium. All wasn’t lost, however, as we were treated to a great tailgate on the day of the game featuring some incredible BBQ from Big Bob Gibson along with the chance to meet Heisman Trophy winners Mark Ingram from Alabama and Desmond Howard from Michigan. 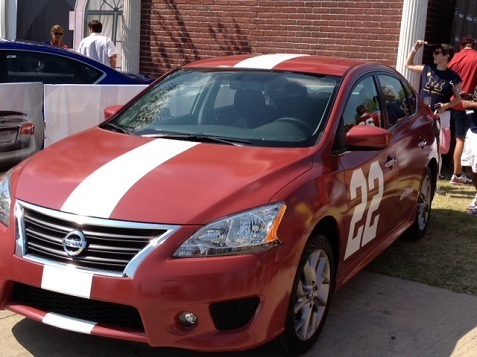 Nissan has been heavily involved with college football and the Heisman Trophy in particular. On Friday night they had the Heisman Trophy on display as they revealed the new Sentra, and Desmond Howard shared some stories like what was going through his head before he struck his classic Heisman pose against Ohio State. Nissan then showed some of the new and hilarious Nissan Heisman House commercials like this one below featuring RGIII. On Saturday before the game, Nissan set up a virtual Heisman House for fans of both teams to enjoy. Outside they had two new Sentras decked out in Alabama and Michigan colors as you can see in the slideshow above. Fans loved it. We won’t have a chance to test drive the new Sentra until next month, but Nissan had plenty of vehicles available for us to drive on Saturday morning, so I made sure to take out the blue 370Z pictured above for a spin around Dallas. As for the new Sentra, I’m definitely looking forward to driving it. I loved the new Altima so I have high expectations for the Sentra as well. As you can see from the photos, the styling has evolved with Nissan’s new front grille standing out in the new design. Sitting in the vehicles I was also impressed with the interior as well. Check back for our driving impressions once we get a chance to take this out on the road.